Contact Jenn for a signed copy. 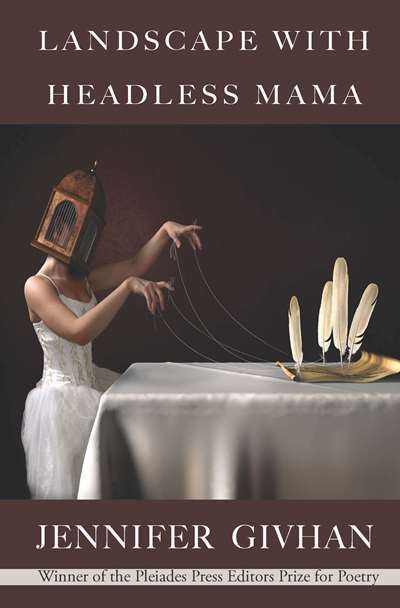 Landscape with Headless Mama is a poetry collection by Jennifer Givhan that explores the experiences of becoming and being a mother through the lens of dark fairy tales. Givhan describes the book as “a surreal survival guide.” A poet with strong roots in the desert southwest, Givhan incorporates fine art and folkloric influences from Latin American culture into her poetry. Drawing inspiration from Gloria Anzaldúa, Frieda Kahlo, Leonora Carrington, tattoo artists, and comic book heroes, among other sources, this is a book of intelligence, humor, deep feeling, and, above all, duende. his heart slowed. The baseline dipped each time she moved. huddled like cats; her mother slept fits in the recliner.